Sometimes it is easy to make goals that sound good, that are specific, measurable, assigned, realistic, time-bound and all the other things we’ve learned goals are meant to be, and that are, quite frankly, totally unimportant. We know we can achieve them, and we also know that whether or not we do achieve them doesn’t really matter. It’s not very motivating or inspiring to work towards a goal that doesn’t really matter, and at the end of the day, whilst it can be satisfying to tick things off a list, if we’re putting our time and energy into working towards something that doesn’t matter, then what’s the point? So today, I’m going to introduce you to the three exercises of Step 4 which I hope will lead to making goals that matter. This is the final step in the #GoalsYouAchieve series before we actually write down our goals! We’ve spent a lot of time with the “What Would That Take?” exercise, and now it’s time to read back through the answers you wrote. 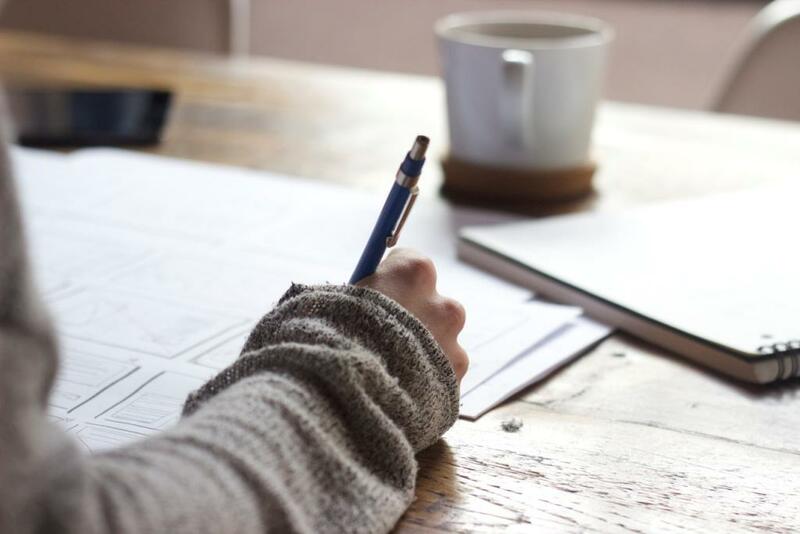 Hopefully, you have already highlighted answers that came up repeatedly in different areas of life (see Step 3, Exercise 2: Coding Commonalities) so as you read through, make a list of these common themes. I expect that for many of you there will be at least one or two things that would support multiple desires in different areas of your life and therefore frequently came up as an answer to the “What Would That Take?” question. Don’t worry about whether it was the ‘root’ answer or not; if it came up repeatedly, jot it down. As you’re reading through, you may find you don’t feel quite the same as you did when you wrote your answers. I know I had that experience with some of my answers. For example, when I’m really exhausted and feeling overwhelmed, my answers tend to swing towards minimalism and all I want is the freedom to sleep, be alone and escape all the demands! At other times, my answers are much more rooted in adventure and possibility, the people I want to spend time with, and the places I want to go. That is one advantage of doing this process over several weeks; it allows a bit of balance between these different emphases. When you’re re-reading, I would focus on the answers that hold true whatever your mood, and discard – or at least change the emphasis of – the ones that seem to be too circumstantial to stand the test of time. Once you’ve got your list, you can also look at any of the desires that are particularly important priorities for you, and add the ‘root’ answer to your list. For example, if you know that “experiencing flow in work” is one of your top priorities right now, go ahead and add your ‘root’ answer for that to the list even if it didn’t come up repeatedly. Don’t do this for more than three areas of life though! The purpose of this process is to set goals that we actually achieve, and one of the best ways to ensure you don’t achieve your goals is to set too many of them, so prioritise by asking yourself “What do I want to change first?” Remember that “first” is only temporary; there will be plenty of time to pursue everything on your list, but you need to start somewhere. This poetry is so depressing it’s almost funny, but does it also hit a nerve? I know I’ve had times when I’ve thought “Oh, what’s the point? 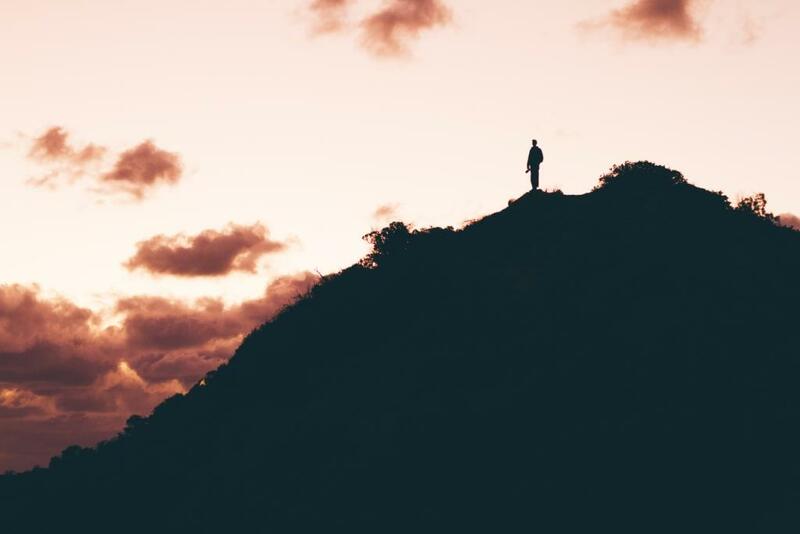 !” and shared the weary despair of ‘the Teacher.’ I think that hitting points of disillusionment along life’s journey is normal, but we don’t want to get stuck there, and so I think it’s important to ask the question “Why?” before we mindlessly make goals. I find this story striking because though we don’t know exactly when it was written, it’s fair to say it’s old, and yet all around us we hear the same story again and again. In fact, I heard pretty much the same story (minus the concubines and slaves, thank God) on a podcast just a couple of weeks ago. So far, in the #GoalsYouAchieve series we have worked backwards from a vision to the specifics, but as we delve into the specifics, it’s really important not to lose sight of the “Why?” question. Why do you want to get up earlier? Why are you going running? Why are you taking weekends off? Why are you getting more sleep? Why are you picking up the phone to your family more? Why are you saving for a bigger house? We were not put on this earth merely to serve ourselves, bow to our feelings or indulge our whims. Nor, by the way, do I believe we were put on this earth to prove our value, earn love or be a slave to other people’s needs. I do, however, believe, that we each have a contribution to make, and I am quite sure that the happiest people on earth are the people who are living according to their purpose (which is…convenient!). What’s your purpose? That’s a big question, but I will say this: it matters, and I don’t think Frederick Buechner was far wrong when he argued that your vocation is found at the meeting point of who you are and what the world needs. …The point here is not that our own interests don’t matter. They do matter—immensely. The issue is the end towards which you direct your interests. …When you ask the question of what needs to be done, there will almost always be more than one good answer. This is where you take into account what you are passionate about, your strengths, your interests, and what you want to do. Goals are indeed about contribution, and I find them so much more motivating when I know that I am writing goals that tie into my purpose and make other people’s lives better as well as my own. Does this connect to my purpose? Why might this matter to others? Don’t feel that your answers have to sound “holier-than-thou,” but do be honest. Asking what our purpose is and why our goals matter to other people is one protection against meaninglessness, but we don’t just want our goals to matter to other people; they need to matter to us too! The final exercise for Step 4 is to choose no more than four of your bullet points (fewer is encouraged!). These should be the ones that you think will have the highest impact, that you believe connect to your purpose, and that you think will positively impact on the service or contribution you make to others, even if indirectly. Now you need a drawing of a tree! Email Friends, there is, of course, a worksheet for this, and because everyone is different, I even made you guys an appendix of different tree styles to choose from! You can download them via your email. 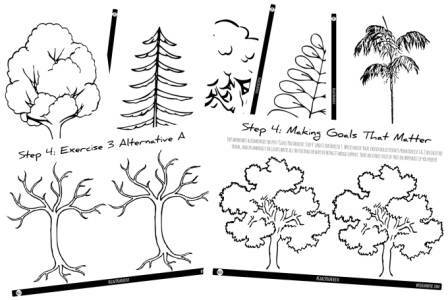 If you’re not on the Wylde & Free email list, you can either join here to get the worksheets, or you can draw yourself a tree! You can become an email friend here: http://eepurl.com/bq64gD Free worksheets included. Once you’ve finished your tree (or trees) it’s a really good idea to put it somewhere you’ll see it regularly. A really significant part of goal-setting is making the destination as concrete, tangible and compelling to ourselves as possible. We really need to focus on the results and make them feel as real as possible to ourselves. You could do this by cutting out your tree and sticking it somewhere you will see it. 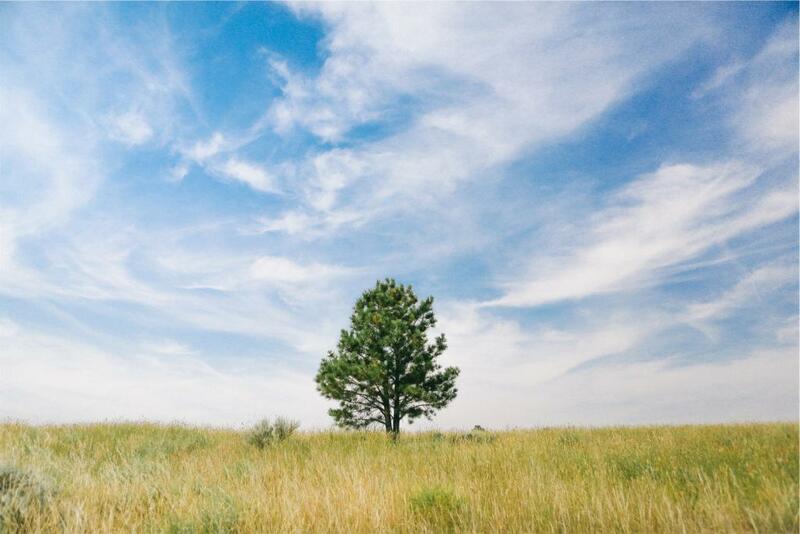 If you’re artistic, you could also make a collage or take a picture that represents the point of this all to you, or you could re-read your Dream Day (Step 2, Exercise 1) and note the ways that your ‘tree trunk’ relates to elements of your Dream Day. Whatever it is you do, make it clear to yourself where your work is going to take you.